Each ml contains estradiol benzoate 2mg. 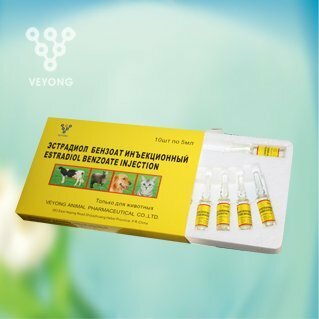 Supply estrogen for femal livestocks , stimulate oestrus and ovulation, increase efficiency of oosperm, and the number of embryo. Enhances the precision of the onset of oestrus and ensures a high fertility oocyte at ovulation. Sheep &goats: 2-6mg per time. Put in cool, dry place, away from direct sunlight.